The Average Age of OpenStreetMap Objects : Neis One! Joseph Reeves asked me on twitter the other day if “anyone knows the average age of @openstreetmap objects?“. Here we go: Based on the complete OSM data history file from here (June 14th, 2014) and some additional lines of code, I conducted a simple analysis. Overall 400,000 mappers of the more than 1.7 million registered members contributed to the OSM project. Almost 375,000 contributors created at least one Node, 325,000 one Way and 70,000 one Relation object. In total the contributors collected more than 2.7 billion Nodes, 263 million Ways and 3 million relations. 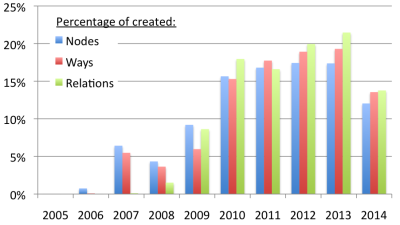 The percentage of newly created OSM objects (Nodes, Ways & Relations) has been more or less at the same level for the past few years (2010 to 2014): with17% to 20%. 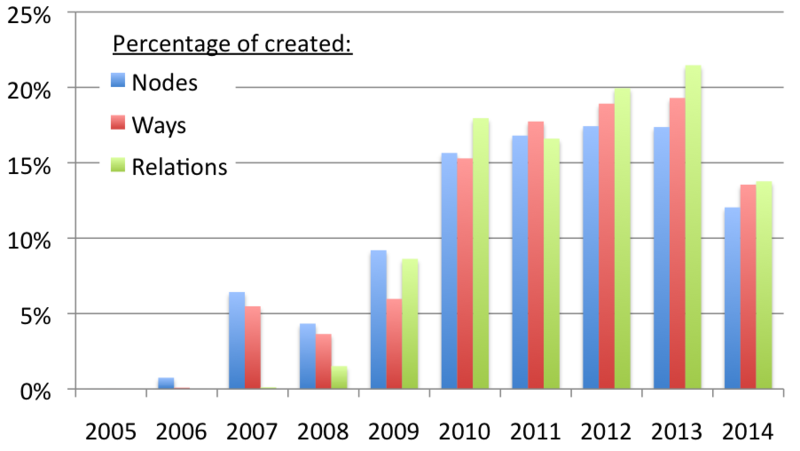 The following diagram shows the percentage of each created OSM object type. 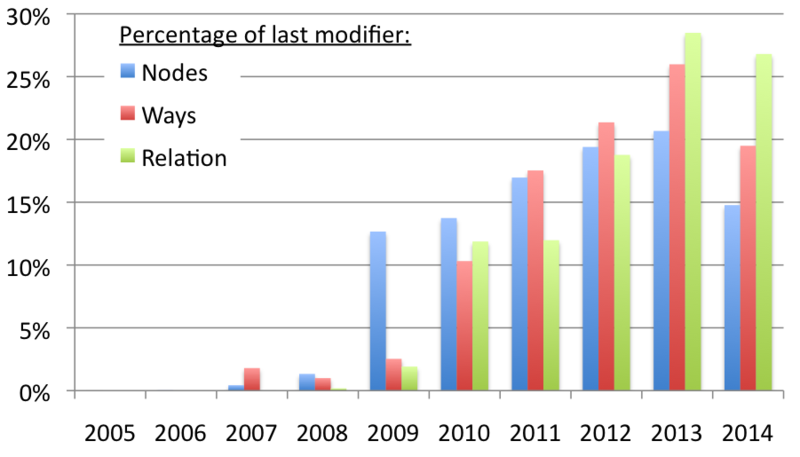 Additionally, I evaluated the number of objects based on the date of their last modification. Utilizing the object timestamps of the last modification, we see a slightly different result for the last 4 years. 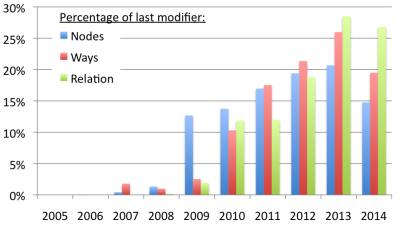 55% of the Nodes, 67% of the Ways and 74% of the Relations in the OSM database do not have a timestamp dated before 2012. However, I guess it would be an interesting visualization, if we could put those numbers on a world map similar to the “OpenStreetMap availability” by Stefano De Sabbata. You can also find some up to date OSM statistics here.